Council Members serve many areas in Illinois. Click on the area links to the right, the map above, or scroll down to find help in your area. Chicago Metropolitan: Evanston, Cicero, Chicago, Oak Lawn, Calumet, and surrounding communities. Chicagoland (Southern Suburbs): Orland Park, Chicago Heights, Wilmington, Bourbonnais, Kankakee, and surrounding communities. 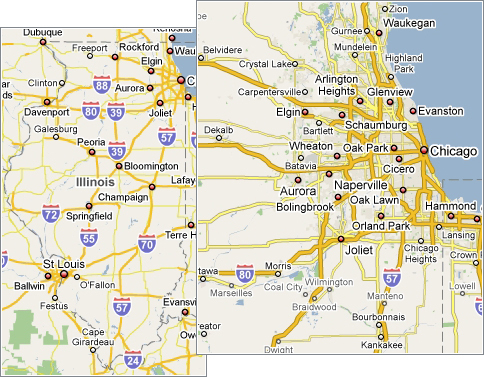 Chicagoland (Western Suburbs): Aurora, Dekalb, Wheaton, Naperville, Joliet, Morris, and surrounding communities. Chicagoland (Northwestern Suburbs): Des Plaines, Elgin, Shaumburg, Bartlett, Arlington Heights, and surrounding communities. Chicagoland (Northern Suburbs): Glenview, Highland Park, Mundelein, McHenry, Gurnee, Waukegan, and surrounding communities. Rockford Metropolitan: Rockford, Belvidere, Freeport, and surrounding communities. Quad Cities: Moline, Rock Island, East Moline, Coal Valley, Galesburg, and surrounding communities including Davenport & Bettendorf, Iowa. Peoria Metropolitan: Peoria, Pekin, Morton, Bloomington, and surrounding communities. Champaign - Urbana Metropolitan: Champaign, Rantoul, Danville, and surrounding communities. Springfield Metropolitan: Springfield, Jacksonville, and surrounding communities. Southwestern Illinois: Madison, St Claire, Monroe, Macoupin, Jersey and Bond Counties. Evanston, Cicero, Chicago, Oak Lawn, Calumet, and surrounding communities. Orland Park, Chicago Heights, Wilmington, Bourbonnais, Kankakee, and surrounding communities. We can provide you contact with various elder care services in the Southern Suburbs of Chicagoland. Although this area is temporarily without a member to assist you we can still help you solve any concerns or problems you may have. Please contact the Illinois Care Planning Council by clicking on the link below. Aurora, Dekalb, Wheaton, Naperville, Joliet, Morris, and surrounding communities. We can provide you contact with various elder care services in the Western Suburbs of Chicagoland. Although this area is temporarily without a member to assist you we can still help you solve any concerns or problems you may have. Please contact the Illinois Care Planning Council by clicking on the link below. Des Plaines, Elgin, Shaumburg, Bartlett, Arlington Heights, and surrounding communities. We can provide you contact with various elder care services in the Northwestern Suburbs of Chicagoland. Although this area is temporarily without a member to assist you we can still help you solve any concerns or problems you may have. Please contact the Illinois Care Planning Council by clicking on the link below. Glenview, Highland Park, Mundelein, McHenry, Gurnee, Waukegan, and surrounding communities. We can provide you contact with various elder care services in the Northern Suburbs of Chicagoland. Although this area is temporarily without a member to assist you we can still help you solve any concerns or problems you may have. Please contact the Illinois Care Planning Council by clicking on the link below. Rockford, Belvidere, Freeport, and surrounding communities. We can provide you contact with various elder care services in the Rockford Metropolitan area. Although this area is temporarily without a member to assist you we can still help you solve any concerns or problems you may have. Please contact the Illinois Care Planning Council by clicking on the link below. Moline, Rock Island, East Moline, Coal Valley, Galesburg, and surrounding communities including Davenport & Bettendorf, Iowa. We can provide you contact with various elder care services in the Quad Cities area. Although this area is temporarily without a member to assist you we can still help you solve any concerns or problems you may have. Please contact the Illinois Care Planning Council by clicking on the link below. Peoria, Pekin, Morton, Bloomington, and surrounding communities. We can provide you contact with various elder care services in the Peoria Metropolitan area. Although this area is temporarily without a member to assist you we can still help you solve any concerns or problems you may have. Please contact the Illinois Care Planning Council by clicking on the link below. Champaign, Rantoul, Danville, and surrounding communities. We can provide you contact with various elder care services in the Champaign - Urbana Metropolitan area. Although this area is temporarily without a member to assist you we can still help you solve any concerns or problems you may have. Please contact the Illinois Care Planning Council by clicking on the link below. Springfield, Jacksonville, and surrounding communities. We can provide you contact with various elder care services in the Springfield Metropolitan area. Although this area is temporarily without a member to assist you we can still help you solve any concerns or problems you may have. Please contact the Illinois Care Planning Council by clicking on the link below. Madison, St Claire, Monroe, Macoupin, Jersey and Bond Counties.